The music video Thinking ‘Bout Somethin’ from Hanson’s upcoming album Shout It Out premieres on MySpace Music today. 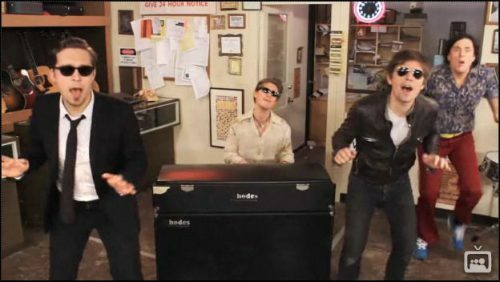 The video is a recreation of a scene from The Blues Brothers, where soul music incited a huge impromptu crowd to dance in the streets. The video was shot on the streets of their hometown of Tulsa, OK, with more than 300 extras, that included two of Taylor’s children, 60 local dancers, hundreds of loyal fans, and an unforgettable appearance by Weird Al Yankovic. The single for Thinking ‘Bout Somethin’ will be available on iTunes on April 27 and the full length album Shout It Out will be released on June 8.